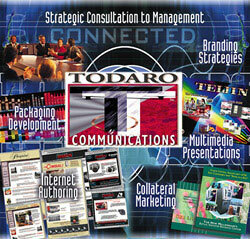 Todaro Communications, Inc. is a full service Strategic Consultation to Management firm that specializes in Creative Solutions for your Corporate Brand or Company Product. With a focus on brand equity, TCI uses a proven, proprietary methodology to develop a higher Brand Retention and Call to Action for your target market. Your business will be able to present and promote a more effective, consistent image across all media to your target customers and corporate decision-makers alike. You and your company will benefit by building your brand, increase identity and market share, therefore improving sales and profitability.